Holland Mold Inc. was founded in 1946 by Frank Hollendonner, an Austrian immigrant who learned mold making at a tile company in his homeland. Having settled in Trenton, New Jersey, the home to numerous potteries, his experience easily got him a job making molds for a tile manufacturer. The likeable Hollendonner made friends throughout the local ceramics industry, and soon got requests to create molds for a variety of items. This triggered the founding of Holland Mold, a company he started in his four car garage with his brother Rudy as his partner. Business was brisk, and Frank mortgaged his home and borrowed money in order to finance the move to a proper facility. 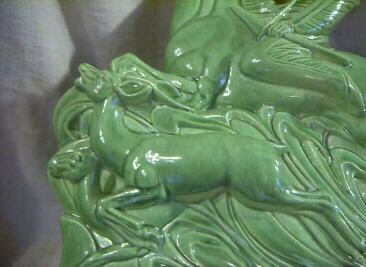 Never producing finished products, they made molds primarily for home crafters, although some of their designs found their way into mass production at various potteries. Holland Mold flourished for fifty-one years, and was ultimately owned by three generations of the Hollendonner family. But times change, and the '80s saw the popularity of rubber master molds, and competition in the field increased. Similar companies, like Gerhart Mueller's Atlantic Mold, soon succumbed, as did Holland Mold in 1997. 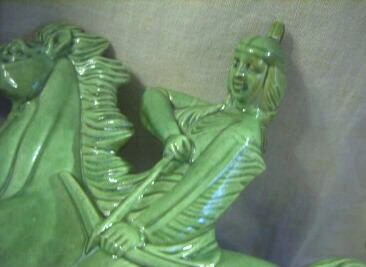 Various ceramic designs can be found (TV lamps, figurines, ashtrays etc.) 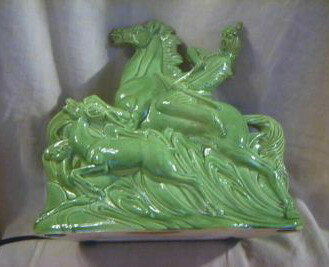 with the Holland Mold mark, some of which are high-fired, mass-produced items. But the majority of pieces, their "hunting indian" lamp in particular, are frequently found made from plaster, and clearly the work of a hobbyist. A debt of gratitude goes to Frank Hollendonner Jr. for graciously sharing the history of his family business. This Holland Mold "hunting indian" design is a good one, and must have been a hit given the cowboy-and-indian craze that flourished in the 1950s. Photos courtesy of Martin from Hilton, New York. Here's a better look at our brave warrior. Given the quality of this example, I suspect that it was made by a high-volume pottery rather than by a home crafter. And here we have the hapless prey! 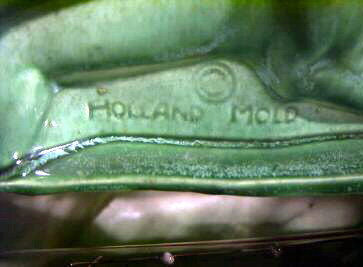 This close-up shows the Holland Mold marking.